The Penitus Oculatus is an Imperial organization serving as a personal security and espionage force for the Emperor. It gained great duties and prestige following the official dissolution of the Blades. Its agents perform infiltrations and counter-espionage against enemies of the Empire, and have been known to carry out assassinations as necessary for the Empire's security. As their primary concerns in protecting the Emperor lie in Cyrodiil, their only presence in Skyrim is a small outpost in Dragon Bridge. Even if the player aids the Stormcloak faction in gaining control over Skyrim, the Penitus Oculatus outpost remains active in Dragon Bridge, despite Stormcloak patrols, which will attack Oculatus-affiliated soldiers. This issue has been addressed by version 2.0.6 of the Unofficial Skyrim Patch; if both the civil war for the Stormcloaks and the Dark Brotherhood questline are completed, they will be removed. "Penitus Oculatus" is Latin for "seeing inward". However, Latin is a very contextual langauge, and would realistically mean something more like "inside watchers" or "internal security". 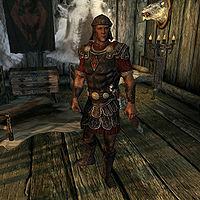 The Penitus Oculatus typically wear a Penitus Oculatus Helmet, Penitus Oculatus Armor, Penitus Oculatus Boots, and Penitus Oculatus Bracers. This page was last modified on 26 March 2019, at 03:11.